On July 16, 2012, we had to send our 14-year old Golden, McGinnis, to the Bridge. Two days later I was scheduled for neck surgery (my week from hell). Since I was going to spend the next 3 months on very restricted activity, we decided to wait until the fall to adopt another brother for our 7-year GRROWLS dog, Murphy. In early August, GRROWLS brought in 8 dogs from one owner. Since it’s difficult to round up 8 foster homes at once, and since Murphy was so sad being an only dog, we decided to foster one of the 9-month old male puppies to see if he was a good fit for Murphy and us. 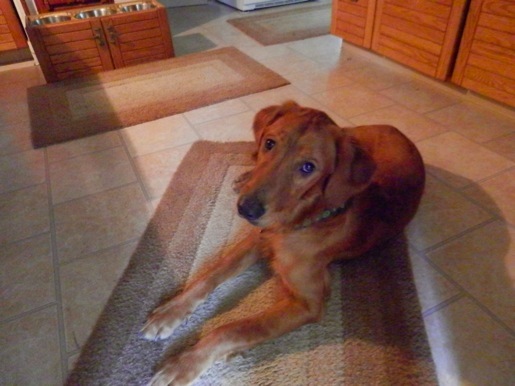 His name coming in to GRROWLS was Big Red and we changed it to McShane (my paternal grandmother’s maiden name), thinking that, even if we didn’t adopt him, he would go to a new home with a decent name. He was a very happy dog right from the start, but he got car sick on the ride home from the vet, didn’t know how to walk on a leash, had no idea what a treat was, and wasn’t sure how to eat out of a raised feeder. We realized right away that he was smart as a whip – he learned “no”, “sit”, “down” and his name within one day. We also realized very quickly that he was a perfect fit for us, although Murphy had to put him in his place a couple of times. His one very bad habit was escaping from our fenced-in back yard to chase squirrels. Being long and lanky, he was able to squeeze under the fence in a few places, so we had to lay firewood along the perimeter. He was still getting out and we couldn’t figure out how until we saw him run the length of the yard, jump on the 4 foot chain link fence, use the links as a foothold and climb over the top. We solved that by draping tarps over the fence in the back so he couldn’t see the squirrels and also couldn’t get a foothold in the links. Since the width of the yard was shorter, we thought he couldn’t get a good enough head of steam to climb over, but we soon realized how wrong we were. Bill was out in the yard and McShane was sitting next to him right by the fence when he saw a squirrel in our next door neighbor’s yard and flew over the fence from a sitting position. An amazing sight for sure! My sister, who lives on 30 acres of land in the wilds of northern Idaho and who had used an electric fence on a big portion of it when she had two Goldens who would go off together on adventures, offered to send us her whole system so we could wire up the fence until he got over this squirrel obsession. That solved the problem. He knows his boundaries and so does Murphy, who will sit up right next to the fence where he knows McShane can’t get at him. Hopefully, we’ll be able to remove the wires from the fence come spring. Thank you, GRROWLS, for another wonderful dog. With Murphy we were foster failures; with McShane we were planned foster failures. These two smart, happy, funny, sweet dogs have filled our home with joy.